Five hundred people wearing yellow and black ponchos gathered in Orlando to create the world’s largest human smiley face. At fifty feet in diameter, the human smiley face was about the size of a basketball court. 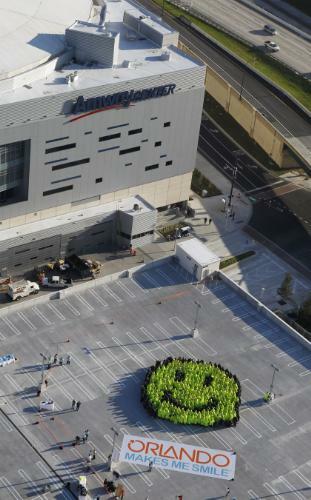 On October 1st, in celebration of the World Smile Day, a giant smiley face was spotted on the top parking deck of the new Amway Center arena. It was made up of hundreds of smiling people dressed in black and yellow, who stood shoulder to shoulder for a good ten minutes. The human smiley face was a result of Orlando’s World Smile Search Campaign, which looked for people who had smile stories to share with the world. In half a year, over 20,000 stories were received, and some of the people who shared their stories were invited to be apart of the smiley face. The human smiley face of Orlando was acknowledged as the largest smiley face in the world, but I seem to recall a very similar event took place in 2008, in the Russian city of Chelyabinsk, and it looks like there were a lot more than 500 participants there. Maybe they just didn’t invite a Guinness Official?